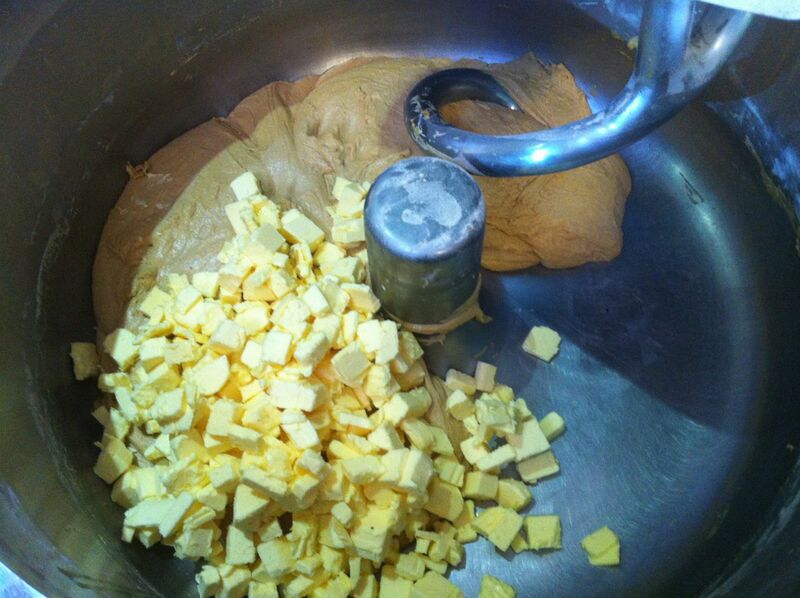 In the past I have had difficulty knowing just how much butter to add to sourdough brioche. I recently got the chance to experiment with a couple of flour to butter ratios at a sourdough class I teach at The Agrarian Kitchen. This recipe has a total of about 625g flour (500 fresh flour + 125 flour from the starter).Two of the students tried 350g butter, and two other used 300g of butter. Both ratios worked well, with 350g having a richer crumb, but 300g was also acceptable and not too bready to loose that classic brioche texture. Note that the photos below are from exactly the same recipe here, exept all quantities were multiplied 10 x. The recipe scaled very well! Must be that the time of year. I have been playing with Brioche too! I have tried a gluten free version. Similar quantities to yours Graham, except the butter, I used only about half the amount. I'll use more next time. I also slightly overcooked them: it wasn't obvious until they were cold, they were just too dry. 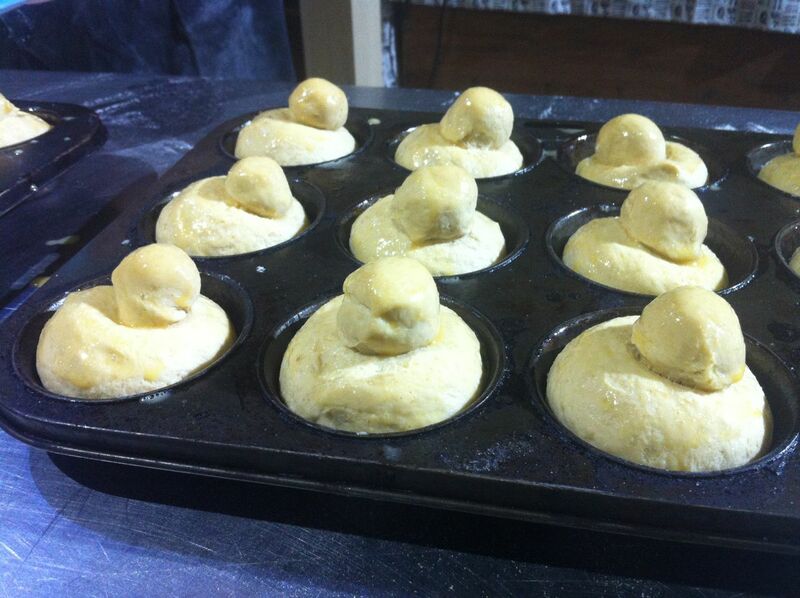 Next time a little less liquid and less time in the oven, I reckon 12-15 miuntes for small brioche. (I used a large muffin pan - 6 x muffins). Next time I'll work at final kneading ans shaping so the crumb texture is more like the 'real' brioche. 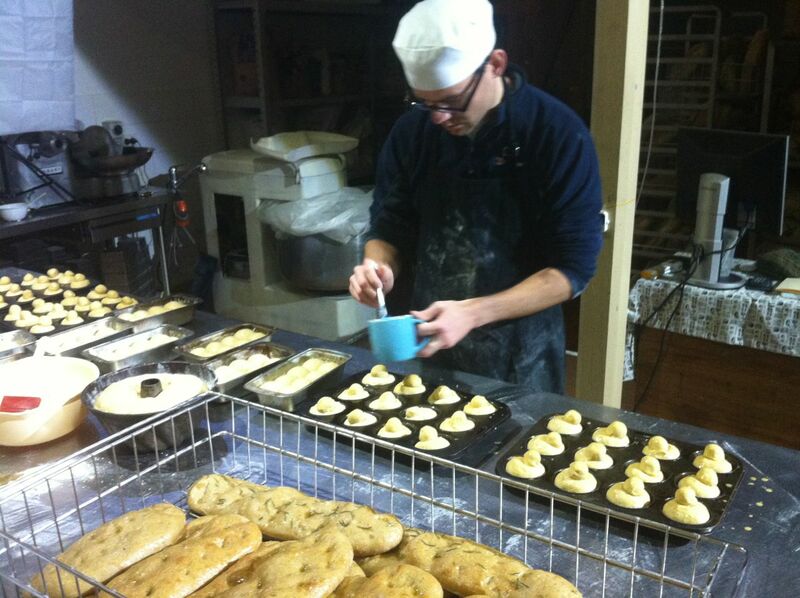 While they were still warm, however, they were another reason to believe that it is possible to bake wonderful gluten free breads without gum and without any other exotic ingredients! 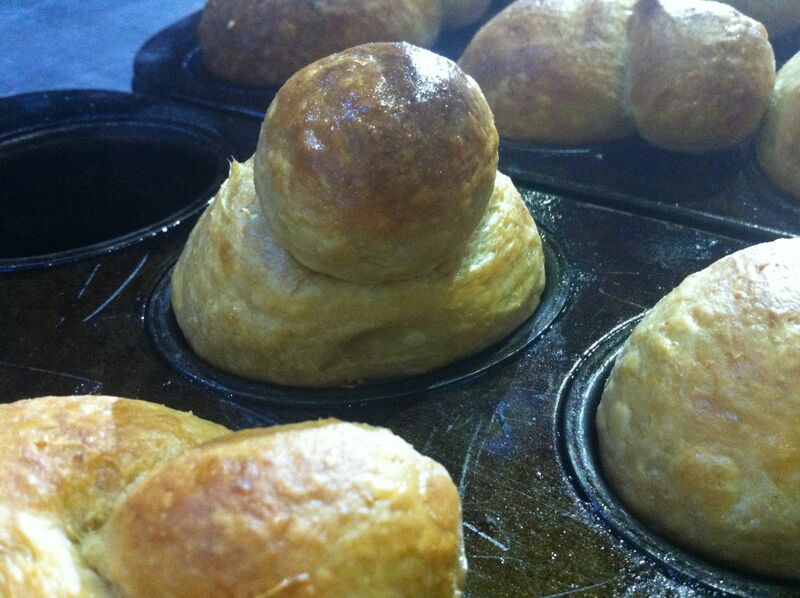 Congratulations on your brioche experiments! I have long been interested in making brioche but have been put off because all the recipes say you need a mixer to handle the batter like dough - and I don't have a mixer. Would it possible to use a hand held mixer or even stir it vigorously? Any suggestions - or will it just not be possible for me without expensive equipment? I don't know how it works with regular flour, but I made the gluten free brioche by hand using a bowl and a spoon. The dough, yes, it was a dough was a little on the wet side at one stage, but resting and cooling soon took care of that. Thank you for your gluten free version Staffo. They look great. I have tried reducing butter in the past and would not be confident of retaining the brioche texture with much more than 5% less of the butter/flour ratio in this recipe. On a pure baker's percent basis, the amount of butter here is actually 48% (of total flour). 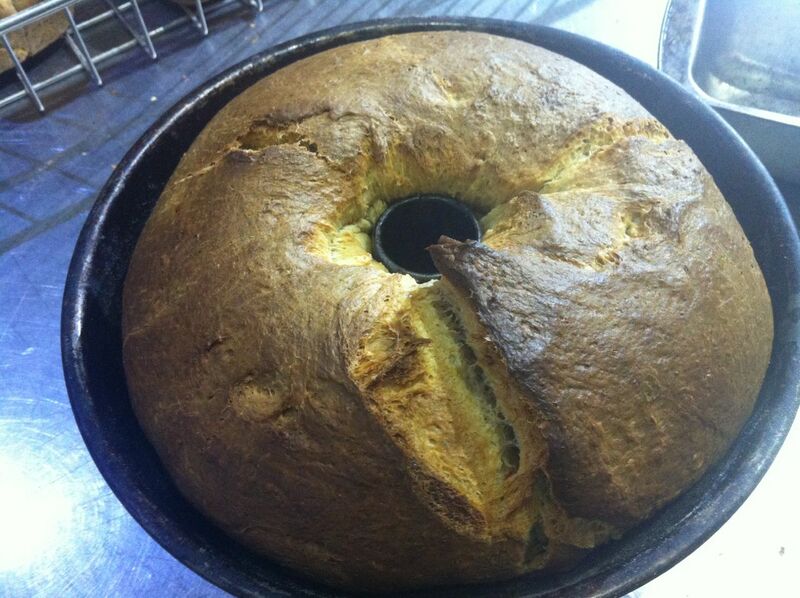 (500g fresh flour + 125g flour in starter = 625g total flour, 300 butter / 625g flour x 100 = 48%). Peregrine I made this recipe by hand the very first time, and the the result was not as good as the next time with a machine. But this is almost certainly because I stopped mixing by hand way too soon. I wasn't tired (well, just a bit), rather I mistakingly thought that the eggy mixture (before adding butter) would remain 'short' and did not have the capacity to become elastic, no matter how much I mixed it. That presumption was confirmed as completely incorrect when I used a machine the next time around. The mixture, before adding butter, is enriched with eggs and sloppy but will eventually become an elastic dough if you just keep working it. I would suggest taking breaks every 10 minutes. It would not surprise me if a paste like this requires 3 x 10 minute sessions (by hand), resting for 10 minutes or so between mixing. 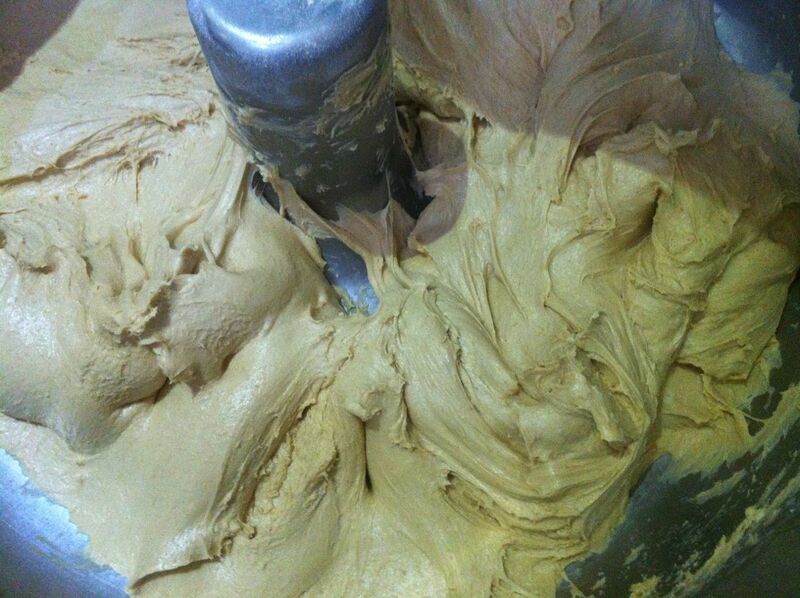 Claw your hands through the mixture to create friction...it takes a long time to resemble a (very soft) dough. Try to get some gluten development before you add the butter. I was wondering if you could uplaod a couple of pictures of the crumb. 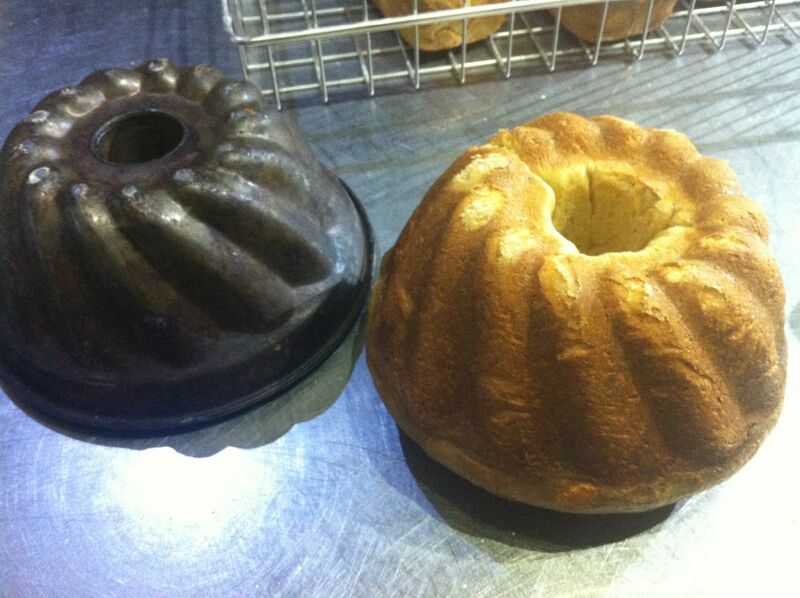 I made your brioche in a Kugelhopf style mould, it came out a little dense. I shaped the dough in the Kugelhopf mould and left in the fridge over night, I am not sure if the metal mould would inhibit the yeast. I left it out on my counter for three hours after refrigerating it last night, then put it straight into the oven. It did not seem to rise on the counter during the three hours. Next time I will put the dough a cane battenon for overnight refrigeration. Also I used freshly milled whole meal flour, maybe that contributed to the dense outcome. Hi Stoneground. I will take and upload some crumb pictures next brioche bake. We relied a lot on oven spring...which was very impressive..to lift our crumb. Please tell me more about your process...did you mix and shape straight into the tin, or did you do a long proof of the entire dough (bulk proof) before shaping and proving in the Kugelhopf tin? Also, refrigerating any sourdough (even well bulk proofed dough) immediately after shaping, extends astronomically the amount of time it needs to rise when removed from the fridge. This is particulary the case when the form is a tin, which initially retains the cold of the fridge, and out of the fridge can act as a heat sink to draw heat away from the dough. Sourdough that is 2/3 or so fully proven in the final proof (in tins, bannetons, etc) can be refrigerated (around 4C) for hours or several days and when removed only requires an hour at room temperature to perform well in the oven. It is even possible to bake straight from the fridge and get good results with this style of dough. On the other hand a sourdough that has no or minimal final proofing before refrigeration, needs to recover from the cold when removed from the fridge before it can get serious about beginning the final rise. Depending on ambient temperatures, it can take 3 or 4 hours for the dough to show movement, and then another 8 or 12 or 16 hours to look like it might be ready to bake. I suspect that 3 hours out of the fridge may not have been long enough if your unproven (?) dough came straight out of the fridge, particularly in a tin....as you observed and commented on. There is also the issue of how efficient your domestic (?) refrigerator is....(less efficient = more rise in the fridge). Whats interesting is that traditonal brioche doesnt have milk? Brioche is a dough that should have no less tha 50% butter and egg. 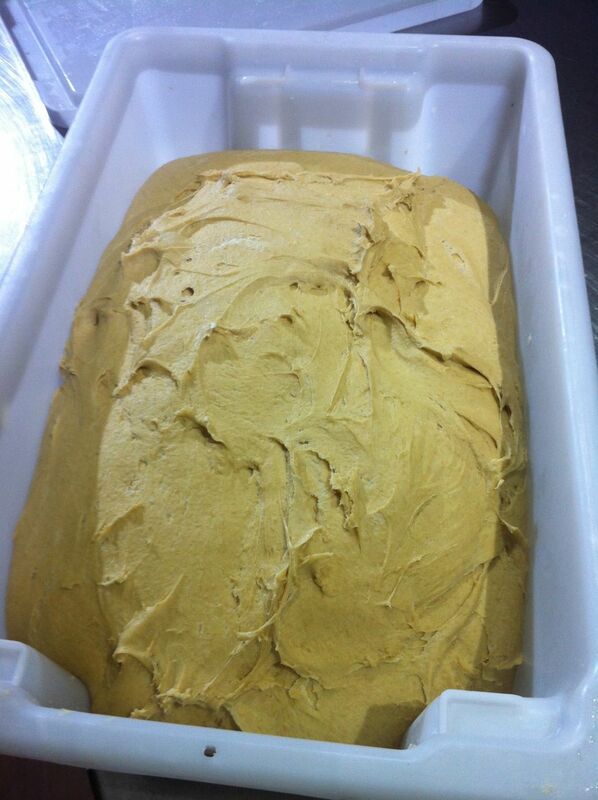 The butter is incorporated late in the mixing and should be cool due to the long time it takes to incorporate, I use an ice jacket so I don't heat the dough too much in summer, the dough also need a long primary ferment to recover 27c and get the yeast working properly. Can I substitute powdered pasturized eggs in this recipie? I am concerned about fresh eggs and solmonella for the long proofing requred of sourdough. I imagine you could with the necessary amount of liquid to reconstitute them equivalent to the fresh eggs involved. Though if my experience with scrambled egg made with this sort of product is any guide, I'm not sure what the result would be like. I'm no bio-chemist, but I thought salmonella would only likely be a problem with raw/undercooked egg and that the core temperature after baking would be more than enough to kill any bacteria present. Just don't eat the raw dough. I did small loaves for 30 mins and the little buns for 20. Everything came over very bouncy and moist. Just wondering an approximate time for after placing them in the muffin trays? You say they should rise 150% to 175% of original size. Is this another 15 hours? Not wanting to pre-empt anything that Graham might have to say but the 15hours was at the low temperature (8 - 15C) whereas the phase you are talking about was at room temperature so I suspect that the time would be much shorter (and variable depending on your room temperature) and that is why the volume increase was specified rather than an absolute time. Made a loaf and rolls with this recipe.. turned great! Thank you! Thank you for giving this recipe a go. It's always fun to see how other bakers make it their own. You got some good rise..important to open and lighten the texture of such a rich dough. Would this amount of dough be the correct size for making a loaf in a 13x4x4 Pullman pan uncovered?